When a patient dies alone on a ward it is upsetting for families and staff. A nurse-led initiative at one trust is ensuring specially trained volunteers provide support throughout the final moments of life. End of life volunteers at Bournemouth and Christchurch Hospitals NHS Foundation Trust. For nurses, being unable to provide all the support that patients and their families need at the end of life can be frustrating and distressing. ‘You feel very guilty,’ says Rachel Bevan, a former ward sister and now head of patient experience, public engagement and the volunteer service at the Royal Bournemouth and Christchurch Hospitals NHS Foundation Trust. 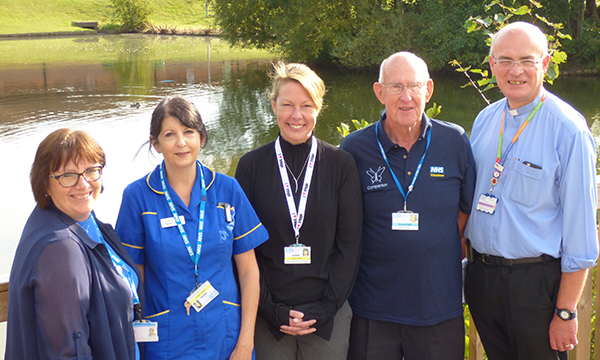 A new service at the trust aims to ensure no one dies alone. It pairs specially trained end of life volunteers with patients, to provide companionship to them and their loved ones. Although the scheme has only been running for six months, it has already been recognised nationally, winning an award in September from the National Association of Voluntary Service Managers. Next they approached 12 long-standing volunteers, who they felt had the right experience, background, skills and attributes to take on the new role. The group includes former teachers, nurses and midwives. A comprehensive three-day training course covered a variety of topics including confidentiality, how to communicate compassionately, issues related to faith and beliefs, the stages of dying and practicalities such as the paperwork following a death. Once trained, volunteers accompanied the trust’s end of life specialist until they felt confident enough to support patients alone. Now the service is offered to everyone approaching the end of their life as part of a personalised care plan. Volunteers sit with patients and any visitors for a four-hour shift, providing support, information and advice as needed. Their presence alone helps relatives feel more comfortable about leaving the bedside to get a cup of tea or take a shower, and if a patient is becoming agitated or uncomfortable, volunteers can alert the nursing staff. Staff nurse and end of life champion Janet Dancer agrees wholeheartedly. ‘They are angels,’ she says. ‘We always make them welcome. We don’t want patients who are approaching the end of their life to be on their own. We’ve tried taking it in turns to sit in with the person, but the ward is so busy that it’s often impossible. Volunteers can be reached via an on-call system and although they are only available from 8am-8pm Monday to Friday, there are plans to extend the service to cover weekends too. A further eight volunteers are due to begin training. Already the service has had a significant impact, particularly for family members who may otherwise have struggled to cope, including those with dementia or autism. ‘One relative told us it had been the most amazing thing to have this service,’ says Ms Bevan. Having supported his relative through a long illness, he found the final days especially difficult to bear. ‘He felt at peace that someone could be there. He wasn’t under pressure to witness something he found so hard to deal with,’ she says. For patients without any family members, having a volunteer with them at the end of their life can be especially poignant. When volunteer Laraine Wren was first approached to become an end of life companion she was delighted. Although initially she was worried nursing staff might feel she was treading on their toes or over-stepping boundaries, the reaction has been overwhelmingly positive. Families are similarly grateful for the service, she says. ‘There is almost relief on their faces that there is someone there who will be with them for the next four hours. We’re a human presence and we know the ropes. As well as providing emotional support, volunteers can also help to resolve practical issues, such as making sure relatives get free car parking and make use of an arrangement with a nearby hotel, where they can have a meal and take a shower. ‘Often relatives don’t want to leave their loved one’s side, but if they know we’re sitting with them they’re happier to take a break,’ says Ms Wren. A background in psychology has helped Ms Wren to manage the emotional stress of the role. Her efforts to maintain her own well-being include keeping a journal in which she records what has happened and her feelings about it, especially when something has particularly affected her.